Below the Tribunal Towers in Guatemala City, within the first level of the parking garage, are the cells where those accused of crimes are held prior to court hearings. 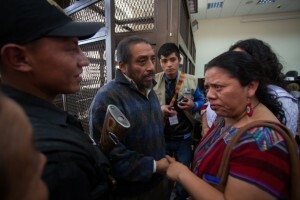 At the gate to one of the cells stands Rigoberto Juarez, a 62-year-old Maya Q’anjab’al, indigenous authority and spiritual guide from Santa Eulalia in the department of Huehuetenango. At his side stands Domingo Baltazar, another community leader from Santa Eulalia. 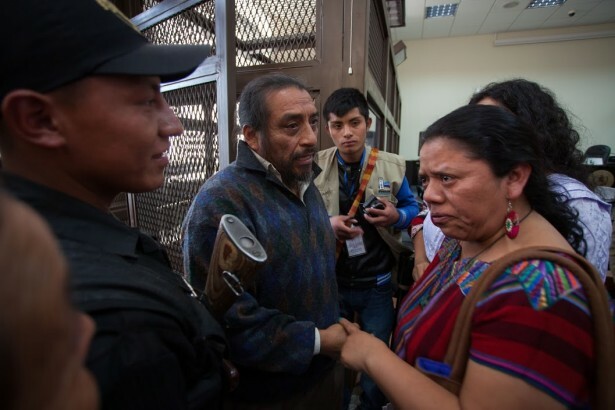 The two don’t look like the other prisoners in the holding cell, but the two have been accused of committing horrible crimes for the leadership in their community’s struggle against the transnational companies seeking to construct hydroelectric dams in their communities. Both Juarez and Baltazar face a laundry list of charges, including: abduction or kidnapping, aggravated assault, instigation to commit a crime, and obstruction of prosecution, as well as clearly false charges for the murder of two men on January 19, 2015, which all witnesses state was carried out by a vehicle associated with the former mayor of Santa Eulalia. As Juarez points out, no evidence has been presented against them. The story of criminalization reflects the lengths that the Guatemalan government will go to guarantee that these leaders remain in prison. Both Juarez and Baltazar were arrested in Guatemala City on March 24, 2015 as they walked down the street in Guatemala City’s historic center. Two days later a judge released both Juarez and Baltazar to house arrest pending an investigation by the Guatemalan Public Ministry. But as they left the courthouse, they were arrested on new charges. Since 2007, Juarez, Baltazar and their communities of northern Huehuetenango have maintained their resistance to the construction of hydroenergy by transnational companies in their region. That year, 46,481 residents participated in a consultation over the expansion of hydro projects. By the end of the vote, 46,472 had declared their opposition to the construction of any mining or hydro project. The Guatemalan Ministry of Energy and Mining has shown little intention in respecting the concerns of the communities of the largely indigenous populations of Huehuetenango. In 2009, the ministry approved the license for the construction of a hydro project in Santa Cruz Barillas to the Spanish firm Ecoener Hydro Energy, which also includes investments from members of Guatemala’s national oligarchy. The Santa Cruz Barillas project is one of several projects in the region, including the Hydro Ixquisis, which is owned by the firm Promoción y Desarrollos Hídricos S.A. in San Mateo Ixtatán, and the Hidro San Luis in Santa Eulalia, which is owned by CM5 S.A.
And there are interests involved in these projects that extend well beyond Guatemala. This expansion of energy production comes as the Inter-American Development Bank and Washington have both reiterated their calls for an increase of energy production in Guatemala and the creation of a “regional energy market” as part of Plan Mesoamerica, which called for regional integration of infrastructures. The plan looks to interconnect the energy systems of Central America through the Central American Electrical Interconnection System. The indigenous and mestizo communities have expressed their opposition to these projects over concerns that the communities would be displaced from their lands, and that many sacred places would be lost. Juarez and Baltazar are not the only ones to face criminalization for their resistance to the construction of hydroelectric plants in their community. Currently there are four other community leaders — Adalberto Villatoro, Arturo Pablo, Francisco Juan, and Hermit Bernardo Lopez Reyes — from Barrillas who all face charges for abduction or kidnapping, aggravated assault, instigation to commit a crime, and obstruction of prosecution. As the communities have resisted, the Guatemalan government and business interests have increasingly utilized the language of the internal armed conflict to label human rights defenders “guerrillas” and “terrorists,” and they have associated the defense of human rights with “armed struggle.” These labels have brought legal charges against community activists. 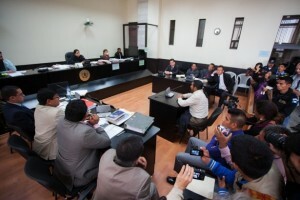 Initially, Guatemala’s Public Ministry utilized charges of “terrorism” against community leaders. One such case is that of five community leaders from San Rafael las Flores who have been active in the struggle against the Tahoe Resources Silver Mine. In 2011, the elderly community leaders were falsely accused of kidnapping, terrorism and illicit association for the kidnapping of 22 Canadian investors who were visiting the mine. They were later cleared of charges. As this change in tactic was made, a study was prepared in May 2014 by the Spanish firm Ecoener Hydro Energy to map the social movement in northern Huehuetenango that is resisting the construction of the dam and classify it as a criminal organization. The document, which is titled “The Criminal Structure of Northern Huehuetenango,” then became the backbone of the prosecution of the leadership of the movement against the expansion of hydro energy in the region. According to the document, at the top of the pyramid of the alleged criminal organization they claim is Rigoberto Juarez. But the situation in Guatemala for activists — especially for communities that stand in resistance to the expansion of extractive industries such as palm oil, mining and energy production — has become increasingly dire. According to United For the Defense of Human Rights Defenders of Guatemala, or UDEFEGUA, human rights defenders across Guatemala have seen a deteriorating situation. According to data from the organization, by 2010, the number of cases of criminalization against social movements had begun to decline from 182 in 2007 to only 26 in 2009. But by 2013, the number of cases of criminalization steadily rose to nearly 300. “[The criminal charges] all come with the intention of damaging the social fabric and social organization,” wrote the Convergence for Human Rights, an alliance between Guatemala based human rights organizations, of which UDEFEGUA is a member. The threat of charges and prosecution creates fear in the communities that are exercising their rights. Other leaders and movements have faced criminalization and charges for their struggle against the expansion of extractive industries in the country. Another target of criminalization is the United Campesino Committee of Guatemala and its leader Daniel Pascual. 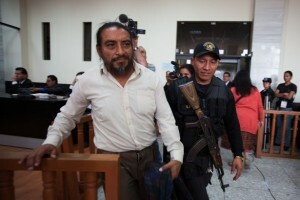 Both have faced accusations by Guatemala’s right wing for being a “terrorist organization” because of their support for the indigenous Kaqchikel communities of San Juan Sacatepéquez and their resistance to the construction of a cement factory, which is owned by one of the most powerful families in Guatemala, in their territory. In 2011, the Foundation Against Terrorism filed charges against Pascual and the campesino organization, including charges of terrorism. The case has gone as far as the country’s constitutional court. In 2015, Pascual took the case, along with other such cases, to the Inter-American Human Rights Court in Washington, D.C. The criminalization of activists in Guatemala is something that is reflective of a trend that is occurring across the Western Hemisphere. Increasingly, the criminalization of activists has begun to follow the narrative of Washington’s global war on terrorism. Across the region, both progressive and right-wing governments in Mexico, Guatemala, El Salvador, Honduras, Paraguay, Ecuador, Colombia and Argentina, among others, have all passed draconian anti-terrorism laws based on the influence of Washington, which has meant a return to the climates of conflicts and enemies of the dirty wars of the 1970s and 1980s. “The text [of the law] will lead to the criminalization of social protests,” Brazilian Communist party leader Jandira Feghali told the Sputnik News. The Brazilian state has passed a series of laws since it first won the rights to host the World Cup. In 2014, the Brazilian Defense Ministry published a manual entitled, “How to Guarantee Law and Order,” which lays out how the armed forces would respond if called upon during the World Cup or Olympics. The document states that its goal during the games is to “preserve public order and safety of persons and property” through the use of military force. These laws and military plans have led to an atmosphere of repression and human rights violations by state forces against protesters. A study by the Brazilian free speech organization Article 19 finds that between January 2014 and July 2015, the police and state forces were responsible for over 849 arbitrary detentions and human rights violations during 740 protests. The use of anti-terrorism laws in Latin America can be traced back to the neoliberal experiment of Chile. Today, the anti-terrorism laws there have been at the center of debate in the administration of Michelle Bachelet, who has looked to reform the law. The law can be traced back to the military dictatorship of Augusto Pinochet, which took power following a U.S.-backed coup against the democratically-elected socialist government of Salvador Allende. The law was originally passed by the dictatorship in 1984 at a time when it faced protests and small armed insurrections. But since 1984, the Chilean courts have utilized these anti-terrorism laws to criminalize and to demonize the indigenous Mapuche communities that have been struggling to defend their rights as indigenous peoples, as well as their territory. In 2014, Celestino Cordova, a 27-year-old Mapuche community and spiritual leader, was charged as a “terrorist arson” and sentenced to 18 years in prison for his alleged part in killing an elderly couple in a house fire. But Cordova’s lawyers have argued that there is not substantial evidence to hold the spiritual leader responsible for the fire. The Inter-American Court of Human Rights in Washington, D.C. has denounced the use of anti-terrorism laws against Mapuche communities and leaders like Cordova. In 2011, the court overturned seven cases against Mapuche leaders charged with terrorism. Despite these irregularities, the law is still in place today, and reflects the dark history of the U.S.-backed dictatorship. Hundreds of Mapuche activists still face charges for terrorism. Back in Guatemala, activists have rallied to support political prisoners such as Rigoberto Juarez, just as the government has upped its campaign against social movements. And activists have kept pressure on the political elite, such as Nobel Prize winner Rigoberta Menchu, through consistent lobbying and through the independent media. Activists have also consistently called contacts in the national media as well to keep the story in the news. This has led to the Guatemalan national media reporting on the visit of delegates from the European Union to Juarez, and a visit by Menchu and 1997 Nobel Prize laureate Jody Williams in February 2016. The movement to support political prisoners has led to the victory and release of many prisoners. On January 14, as Guatemala inaugurated its new president, Jimmy Morales, two political prisoners from Santa Cruz Barillas, Saúl Méndez and Rogelio Velásquez, were released from prison after nearly three years of incarceration on false charges of femicide. 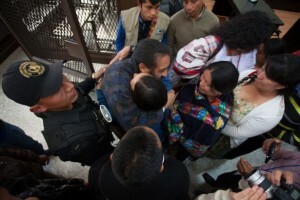 The two had been cleared of charges in October 2015, after a court in Guatemala’s second largest city of Quetzaltenango acquitted them of the charges. The pair had received significant support and coverage thanks to activists such as Ixchíu and others, who continually kept their situation in the public eye through festivals, actions, and online campaigns.